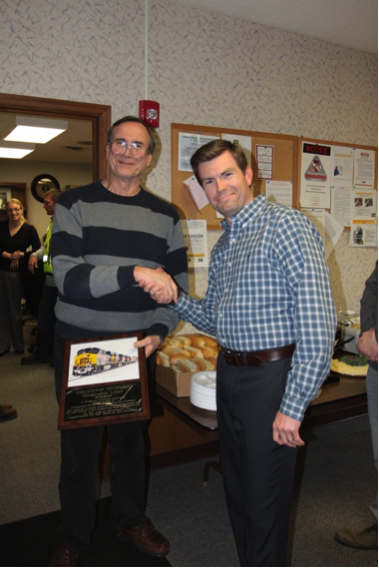 April 2016 - Iowa Interstate Railroad, Ltd. April 2016 - Iowa Interstate Railroad, Ltd.
As the Company upholds its commitment to safety, it is only through each and every one of our employees’ efforts that we protect the public and assure we all return home intact. Although safety is an integral part of everyone’s job, we would like to specifically recognize Adam Haynie and Zach Larue this month for their recent conscientiousness in reporting a rough spot while driving their train on March 20. Our MOW crews speedily fixed the issue. Adam and Zach join a number of their colleagues for excellent, professional performance. They are part of a select cadre that lead our safety efforts by example.